Hundreds of people have celebrated best practice and innovation in the UK waste and resource management industry at MRW’s National Recycling Awards 2017. The event, at the Hilton Hotel on Park Lane, marked the culmination of the difficult task of sorting out the winners from finalists in 20 categories. Three finalists won two awards: Argent, Ecosurety and Kwiksweep. The full list of winners is here. 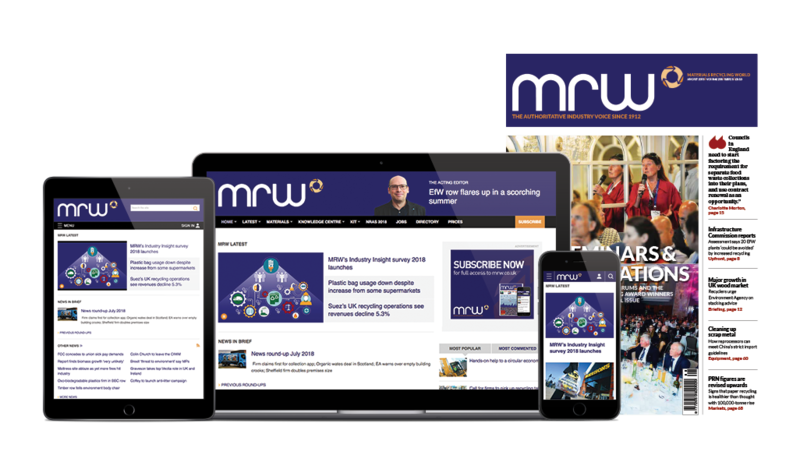 Earlier in the evening, MRW editor Robin Latchem urged the new environment secretary, Michael Gove, to address the declining household recycling rate in England, especially as devolved administrations in Scotland and Wales were doing better. “Household recycling in England is creaking and needs some TLC,” he said. He also spoke about the important role of trade journals, such as MRW, to reflect their industries. “I’m wary of referring to the Grenfell Tower tragedy but the magazine Inside Housing had been writing about fire risk in tower blocks for years – but few were listening. They should have been. He presented the Editor’s Award to Andy Rees, head of waste strategy at the Welsh Government, in recognition of the strides taken by the administration in making Wales one of the top three recyclers in the world. Receiving the award, Rees said the achievements were down to successive ministers, the National Assembly for Wales, local authorities and “the fantastic Welsh public”. “We have come a long way since devolution in 1999. This gave us the ability to set our own policies on waste, including our own targets and legislation,” Rees said. “On a personal note, having the courage of one’s convictions and a very strong evidence base, have been paramount in delivering such high recycling levels – second in Europe and third in the world, according to a study carried out by Eunomia. If there had been an award for the best-dressed finalists, the prize would have gone to partners Veolia and Reuseful UK, whose representatives attended the ceremony in outfits made from recycled uniforms and PPE. Each dress was made from 100% recycled materials, including matching video cassette handbags. The designs highlighted the social and environmental importance of the project Re:Form, for which they were nominated.